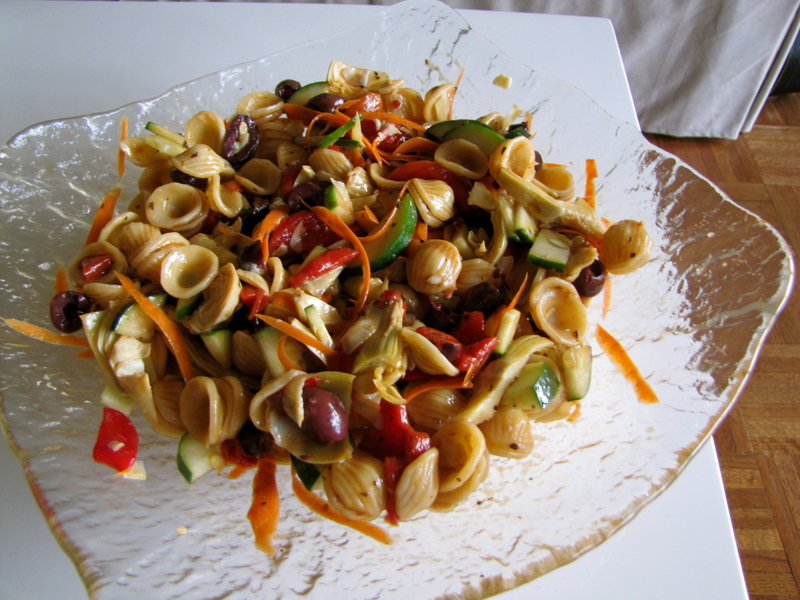 Italian Pasta Salad – Voila! I just got back from Houston, Texas where I had some great BBQ and Tex-Mex. But when I returned to D.C., it was hot and I felt weighed down by the growing humidity. In an effort to escape all these feelings I made a trio of salads for dinner! This is just one of the refreshing salads that landed on the table. It is super easy to make and totally versatile. I don’t even know how to write the exact measurements because it was all on a whim. Maybe I’ll write the measurements like they did in 19th century cookbooks where they described a recipe by a look, feel, handful and so forth. Have fun and happy summer! 3. Transfer cooked pasta to serving bowl. Add veggies and mix. If you think it needs more veggies, add them! 4. Pour dressing over pasta mixture and stir. Taste and add more as necessary. Refrigerate for a few hours before serving. That’s how the Italians cook — they don’t really measure anything — just eyeball it! This looks beautiful and delicious! Pingback: Three Bean Salad « Voila!